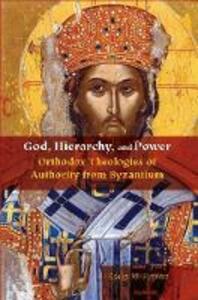 In the current age where democratic and egalitarian ideals have preeminence, Eastern Orthodox Christianity, among other hierarchically organized religious traditions, faces the challenging questions: "Why is hierarchy maintained as the model of organizing the church, and what are the theological justifications for its persistence?" These questions are especially significant for historically and contemporarily understanding how Orthodox Christians negotiate their spiritual ideals with the challenges of their social and ecclesiastical realities. To critically address these questions, this book offers four case studies of historically disparate Byzantine theologians from the sixth to the fourteenth-centuries-Dionysius the Areopagite, Maximus the Confessor, Niketas Stethatos, and Nicholas Cabasilas-who significantly reflect on the relationship between spiritual authority, power, and hierarchy in theoretical, liturgical, and practical contexts. Although Dionysius the Areopagite has been the subject of much scholarly interest in recent years, the applied theological legacy of his development of "hierarchy" in the Christian East has not before been explored. Relying on a common Dionysian heritage, these Byzantine authors are brought into a common dialogue to reveal a tradition of constructing authentic ecclesiastical hierarchy as foremost that which communicates divinity.